The FLEXspace Founding Platinum Partner! Herman Miller brings over 40 years of knowledge to education. At Herman Miller, we work closely with college and university leaders to use places as an asset to address an institution’s mission. Our problem-solving, research-driven approach has led us to knowledge and insights that keep us in tune with the needs of education leaders. The solutions we present consider today’s pedagogy and create learning spaces that accommodate change, innovation, and evolution. See the blog post about the 2015 winners of the Herman Miller Student Video Contest. 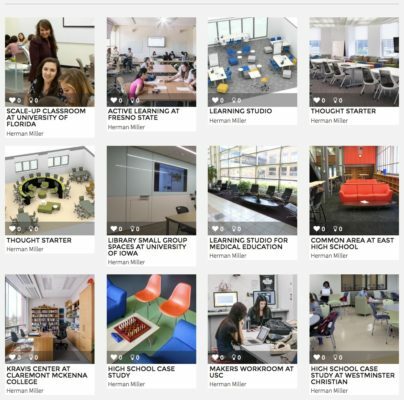 Check out the latest Educational Solutions from Herman Miller. Watch this short video and see how you can reconfigure a classroom so it can meet the needs of a variety of courses, instructors, and students. Cool animations here from Herman Miller Education! See this case study from California State University Fresno. Herman Miller is proud to be the Founding Partner of FLEXspace! Read the announcement.